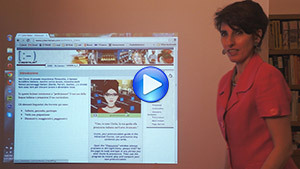 Watch this video introduction in Italian where Maura Garau, founder of cyberitalian.com, explains how to navigate in the lesson. Browse through the lesson with Maura, using the menu on the right. Nel Corso Avanzato incontrerai Pinocchio, il famoso burattino italiano, mentre cerca lavoro, incontra molti famosi personaggi italiani (Dante, Ferrari, Galileo...) e chiede loro cosa fare per trovare lavoro e diventare ricco. In questa lezione comincerai a "perfezionare" il tuo uso della lingua italiana e preparerai il tuo curriculum. To continue with the lesson, click on the icons below or use the menu on the right. Learn the cultural aspects with "Cultura"
Discover the grammar with "Grammatica"
Have fun and reinforce what you have learned with "Attività"
When you are ready, test yourself with "Esame"